The following Statement Of Faith (Short Form) was adopted on May 12, 1996 by the Ray Of Hope Council in representation of the Congregation and the Pastors. This web page was updated November 5, 2016 to include the addition of our statement on the Doctrine of Universal Salvation, adopted into the By-Laws in September, 2011. That statement is at the end of this page. All persons of any belief system, and those with no faith or belief of any kind, are welcome at all of the activities of Ray Of Hope Church Of Our Lord Jesus Christ. By this we mean we promise to embrace and include you, not just tolerate your presence. Persons who attend Ray Of Hope are "free thinkers" who bring a wide spectrum of experience and exploration when it comes to matters of "faith" and "spirituality." Freedom of thought, freedom of inquiry, freedom to question, wonder, and to grow are treasured principles at Ray Of Hope Church. Each person is uniquely and personally responsible for what they choose to believe, and for their own eternal journey. I, Pastor Benedict, describe this gift God has given us as an "Open Christianity." It is my opinion that an Open Christianity is God's personal, intimate, and eternal gift to all humanity. When I use the term Open Christianity it is an indication that we acknowledge what God has given us in the Church of the Only Begotten Son, the Eternal Word Incarnate, is so huge in its spectrum and scope of variation and inclusion that we will never be able to explore, never fully understand, or even need everything included in this gift. There is no way to find all of the outer perimeters (the outer borders) or all of the parameters (the measurements in all directions) of this Open Christianity because it is an expression of the love of God, the revelation of God's self through Christ and in the powerful ministry of the Holy Spirit, in my opinion. Therefore, at Ray Of Hope Church we are not consumed with limits on what we cannot do because this or that is not consistent with the boundaries drawn by denominational records, teachings, or practices. Instead we are amazed, always awakened, and newly aware of the possibilities and the potential we have in what we call an Open Christianity to whatever the Holy Spirit is saying to the churches today. We are assured in the Book of Revelation Chapter 2, verses 7, 11, 17, 29, and Chapter 3, verses 6, 13, and 22 that the Holy Spirit would be continuing to speak to us throughout the dispensation of the Church from its beginning until Christ comes to rule on the Earth. So, each person is invited while participating in the life of Ray Of Hope Church Of Our Lord Jesus Christ to explore through any and every avenue what the movement of the Holy Spirit is saying to them and guiding them to. While all who attend our functions are free to wonder and explore their own faith and spirituality, the Pastoral and Teaching Ministries of Ray Of Hope Church Of Our Lord Jesus Christ, Inc. adhere in unity to these Articles Of Faith and base all Doctrines, Dogmas, Teachings and Practices of Ray Of Hope Church Of Our Lord Jesus Christ on these Articles Of Faith. + We believe in One God Almighty, maker of heaven and earth, of all that is seen and unseen. + We believe in one Lord, our Sovereign, Jesus the only Christ, the only Son of God, Anointed Messiah, Eternal High Priest, Savior of the world, eternally begotten of God, God from God, Light from Light, true God from true God, begotten, not made, of one being with God, and through Jesus all things were made. so that whoever believes in Jesus has eternal salvation, eternal safety, and is a member of the eternal community of God. and was born of the Virgin Mary and became truly human, like us in all ways except He never sinned. and to judge the living and the dead, and his Sovereign Realm, His Eternal Community, his kingdom will have no end. + We believe in the Holy Spirit, the Lord, the giver of life, who proceeds from God and the Son, who with God and the Son is worshipped and glorified, who has spoken through the prophets, and who empowers and gives life to the Church. + We believe in one holy universal/catholic Christian and apostolic Church. for the sign of repentance, faith in Christ, and forgiveness of sins. + We look for the resurrection of the Church, the saints in Christ, and the life of the eternal world to come under God's reign, where there will be liberty, justice and equity for all with God, in Christ, and through the Holy Spirit. + We the Faith Community of Ray Of Hope Church Of Our Lord Jesus Christ, believe Christianity is the revelation of God in Christ Jesus, and the religion of God in Christ set forth in the Scriptures. Christ Jesus is foretold in the Hebrew Testament (formerly known as the "Old Testament") and, presented in the Christian Testament (formerly known as the "New Testament"). Christ Jesus is proclaimed by the Christian Church in every age and every land. + The foundation of Ray Of Hope Church Of Our Lord Jesus Christ is Jesus Christ. We are not creating a new Church, or a new religion. The foundation is laid by God, and we take our place as spiritual stones being built into the Church triumphant. + We believe that the Bible is the divinely inspired written Word Of God. The Bible is the final authority for believers in all matters of faith and Doctrines. All teachings and practices must be in harmony with the Word Of God. + We believe that all people, with the exception of Jesus the Son of God, have sinned and are therefore in need of the new birth in Christ Jesus before they can enter the Eternal Community of Jesus. + We believe that Salvation is available to all who call on the Name of Jesus Christ, and are re-born into the Life of Christ. + We believe the Church is made of all people from every time and every place who believe in Christ Jesus. Believers constitute the priesthood of Jesus, the holy nation, the royal generation. + In Ray Of Hope Church Of Our Lord Jesus Christ we believe in remaining faithful to the Apostle's teaching, the Community of believers, the breaking of the bread, and prayers. + We believe the local Church is called to evangelize the local people by social action and ministry. + Ray Of Hope Church Of Our Lord Jesus Christ is Christ-centered in all of its teachings, and therefore does not ascribe to the dogmas, teachings, or practices of any denomination, or para-church organization of the Christian Church. Rather, we maintain an autonomous freedom to draw from the two millennia of immense riches known in all denominations of Christianity. Ray Of Hope Church Of Our Lord Jesus Christ is an "independent" local Church. This does not mean we stand alone, as though on pride or arrogance, rather we seek to share an interdependence with other assemblies and fellowships of believers who endeavor equally as hard as we do to bring the Gospel to all people. Statement on the Doctrine of Universal Salvation. SCRIPTURE VERSES TO SHARE WITH OTHERS WHEN SHARING FAITH TOGETHER. Romans 15:14 Now may the God of hope fill you with all joy and peace in believing, that you may abound in hope by the power of the Holy Spirit. Titus 2:11 The grace of God has appeared, bringing salvation to all. John 5:24 Those who hear my word and believe in God who sent me, have eternal life, will never come under judgment and have passed from death to life already. Romans 10:13 "For whoever calls on the name of the Lord shall be saved." (repeated at Joel 2:32; Acts 2:21 the Day of Pentecost). All people from any human estate or situation in life are included in these words "whoever, anyone who" asks. The word Lord here refers to God principally, so those who call on God shall be saved. Isaiah 25:6-8 "On this mountain the Lord of hosts will make for all peoples a feast of rich food, a feast of well-aged wine, of rich food full of marrow, of aged wine well refined. And he will swallow up on this mountain the covering that is cast over all peoples, the veil that is spread over all nations. He will swallow up death forever; and the Lord God will wipe away tears from all faces, and the reproach of his people he will take away from all the earth, for the Lord has spoken." For easy instructions on how to use Skype to participate in our activities click here. 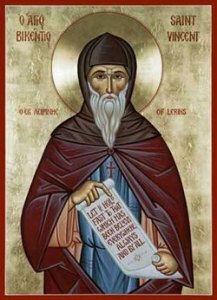 St. Vincent, Monk of Lerins in the 5th Century wrote ".....all possible care must be taken, that we hold that faith which has been believed everywhere, always, by all...This rule we shall observe if we follow universality, antiquity, consent. We shall follow universality if we confess that one faith to be true, which the whole Church throughout the world confesses; antiquity, if we in no wise depart from those interpretations which it is manifest were notoriously held by our holy ancestors and fathers; consent, in like manner, if in antiquity itself we adhere to the consentient definitions and determinations of all, or at the least of almost all priests and doctors. All content on the Ray Of Hope Church, Inc. web site is written for intelligent and interested nonspecialists. Academic and professional specialists are invited to contact us at rayofhopechurch@aol.com for information on how to visit our St. Benedict of Nursia Memorial Library where all of the material on this web site is sourced. Our library currrenty has over 6,000 holdings. Church Of Our Lord Jesus Christ, Inc.
and persons of all gender expressions. no faith, no religion, or have no idea where to start with religion. A spiritual home for those who are "spiritual but not religious." the Church by us, for us, 4 U! and is serving Syracuse, Ithaca and Elmira New York. through SKYPE on the Internet. We never held a vote to decide if we would be an INCLUSIVE church for you. We are not an OPEN AND AFFIRMING church for you. church where you can attend as long as you blend in quietly and discretely. THIS is the church where YOU belong. by us, for us, and made by You. Help us stay on line by making a tax deductable donation. Jesus is the Only Begotten Son of God. This means God and Jesus share the same being. Mary shared her humanity with Jesus. Jesus is the only human being to be born of the very God. As Christians we celebrate and proclaim this Truth. To read the Scripture verses that explain this Doctrine (this unchangeable truth) CLICK HERE.